Babe Tancrede refered to as The Babe. My Mother and Father used to follow a lot of the races, and my father was an accomplished mechanic. Don't know where this was, and I don't have a date. Tex Taggert a friend of my parents, taken outside of one of their old hangouts, the Rosebud Diner, Davis Square, Somerville Mass. The mans name in the picture is unknown. Ed Pierce (standing) with his buddy Charlie In the Snow January 1945 on his 1937 EL. Ed Pierce at work at Andrews Indian Sales, Roxbury Mass, 1947. He would take flywheels out to Indian in Springfield for Balancing after he would lighten and polish them building some quick motorcycles. Spiers Photo. 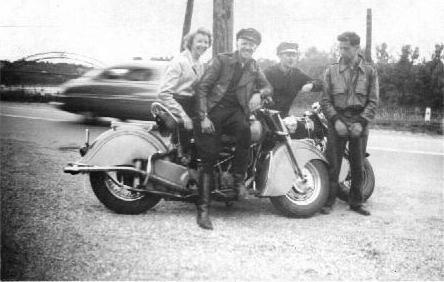 Ed and Helen Pierce on their Indian possibly 1949. Ed Pierce with his Knuckle outside of an apartment on Beech St in Somerville Mass 1946. Ed Pierce 1946 Indian Photo Taken at the Gypsy Tour, Laconia NH, June 18-19 1949.